We’d love your help. Let us know what’s wrong with this preview of The River City Chronicles by J. Scott Coatsworth. A group of strangers meets at Ragazzi, an Italian restaurant, for a cooking lesson that will change them all. They quickly become intertwined in each other's lives, and a bit of magic touches each of them. Meet Dave, the consultant who lost his partner; Matteo and Diego, the couple who run the restaurant; recently-widowed Carmelina; Marcos, a web designer getting too old fo A group of strangers meets at Ragazzi, an Italian restaurant, for a cooking lesson that will change them all. They quickly become intertwined in each other's lives, and a bit of magic touches each of them. Meet Dave, the consultant who lost his partner; Matteo and Diego, the couple who run the restaurant; recently-widowed Carmelina; Marcos, a web designer getting too old for hook-ups; Ben, a trans author writing the Great American Novel; teenager Marissa, kicked out for being bi; and Sam and Brad, a May-September couple who would never have gotten together without a little magic of their own. To ask other readers questions about The River City Chronicles, please sign up. The writing is this is good but it isn't my cup of tea. The soap opera parts took up too much time where I would like love story so the balance was off for me. This is a book celebrating the diversity of life. While it follows a lot of different people and stories, all of them were connected in some way or another. From the beginning of this book, I felt like it was pure sunshine. It just had so much life and was everything I wanted. It was well-written and refreshing. Once I got a little further in the book, there were some characters I cared about more than others, so I tended to speed through some chapters. It was emotional in many different ways. I This is a book celebrating the diversity of life. While it follows a lot of different people and stories, all of them were connected in some way or another. From the beginning of this book, I felt like it was pure sunshine. It just had so much life and was everything I wanted. It was well-written and refreshing. Once I got a little further in the book, there were some characters I cared about more than others, so I tended to speed through some chapters. It was emotional in many different ways. It followed many people with different struggles, successes, heartaches and just life changes in general. I wanted more of Matteo and Diego's story, though! They were by far my favorite characters. This book was different from anything I have ever read but overall, I enjoyed it! I have read many books with ensemble casts and the style always calls to me. It’s always interesting to meet a large cast of characters and then see how their lives will inevitably intersect. There are many characters here with different ethnic backgrounds as well as different identities that makes this cast diverse. In the author’s note, Coatsworth states that he was going for the style of creating a story within a chapter, and with that he was successful. Each ch A Joyfully Jay review. In the author’s note, Coatsworth states that he was going for the style of creating a story within a chapter, and with that he was successful. Each chapter told a little of the story within itself and advanced the movement for those characters, while setting up the links to the rest of the cast. The author also discusses “magical realism” and how he wanted everyday magic to touch the characters. While this was seen on page, the execution of that was less successful for me. The main issue here is with so many characters, there has to be a draw to want to continue to read about them. While the characters were fine (simply fine), there was no pull or motivation for me to want to continue to read any of their stories and I found myself putting this book down often. There were some couples that were already together and some couples that were just meeting and starting out and there was a distinct lack of chemistry for any of them. There were no intimate scenes on page, but there was also no spark between any of the characters and the characters all remained fairly flat. The story is told from multiple points of view, which is my favorite, but none of the characters had a voice for me and it all read in a narrative tone which made the characters difficult to engage with. Read Michelle's review in its entirety here. From that review: I always seek out an author's foreward, if there is one, before start into a book. It often gives me insight into the writer's mindset when laying out their story and characters, even the inspiration behind the origins of the tale. In this case I got that and more. The smells of boiling sauce, pasta, garlic, and nutmeg, rosemary, and oregano and other herbs permeate the air in a little restaurant on Folsom Boulevard in Sacramento. Welcome to Ragazzi (in English, the boys), the restaurant Matteo Bianco inherited from his uncle, and “the ticket out of Italy” for Matteo and his husband, Diego Bellei. But there are only three customers… and only two more for the night. So begins The River City Chronicles, by J. Scott Coatsworth, and I couldn’t put it down. Dieg The smells of boiling sauce, pasta, garlic, and nutmeg, rosemary, and oregano and other herbs permeate the air in a little restaurant on Folsom Boulevard in Sacramento. Welcome to Ragazzi (in English, the boys), the restaurant Matteo Bianco inherited from his uncle, and “the ticket out of Italy” for Matteo and his husband, Diego Bellei. But there are only three customers… and only two more for the night. Diego and Matteo are not sure they are going to make it, and are afraid they will have to go back to Italy, their tales between their legs. But Diego has an idea, una scuola di cucina, an Italian cooking school. And so, this novel of love and family, and cooking and secrets and a little magic, begins, when “a group of strangers meet at Ragazzi… for a cooking lesson that will change them all.” These strangers will find connections to each other and their lives will intertwine as “a bit of magic touches each of them” (back cover), and none of them will be the same. These strangers make up an intriguing cast of characters. Besides Matteo and Diego, there is Dave, a human resources consultant, who has lost his partner; Carmelina, recently widowed; Marcos, a web designer who is getting too old for hook ups; Ben, a trans writer working on the Great American Novel; Marissa, a teenager kicked for being bisexual; and Sam and Brad, a May-September couple. Brad runs the local LGBT center, and Sam seven years older, writes suspense novels. With this motley crew, Coatsworth creates complex characters, all too human, with flaws and foibles, contradictions and ambiguities, and secrets, both small and large. And secrets have a way of being found out. Some secrets are burdens of pain, some when exposed, will bring pain and heartache, and some need to be known. River City is told in short chapters, an admitted influence of the “amazing Armistead Maupin” and his Tales of the City, which are, in part, a love song to San Francisco. So it is here, River City is Coatsworth’s love song to Sacramento. In both novels, the city itself becomes a character, and these urban geographies are shaped by, and shape the lives of, the characters and who they love and how and when. Is it just a coincidence this person came into one’s life at this time and place? If we have lived elsewhere—if the River City group of strangers had not seen the flyers, and didn’t go to the class, then their lives would be quite different. The connections they make in this class become the bonds that make a found family, even as the no-longer strangers negotiate the families into which they were born. In addition to being a family novel, River City is also a love story, or rather, interconnected love stories: between the various couples, between friends, between parents and children, and sometimes this love is rejected or pushed away. Love is changed and challenged by the past and its secrets. River City is also a fairy tale, in both senses of the word, as one focus of the novel is on its gay characters and their relationships, and such gay issues and themes as the often complicated and tense relationships between LGBT teenagers and their parents, transgender acceptance and transphobia, and gay foster parenting. There is also fairy magic, described by Coatsworth in the introduction as magic realism. The green flyer announcing the cooking school sparkles when left on a table on the restaurant and this flyer appears and reappears, as it seems to find the strangers who come to the first cooking class. The sparkles appear and reappear, as well, as perhaps conduits of energy, of connection, of love waiting to be discovered. Other magic is alluded to, as when Brad remembers his job before director of the LGBT center, working for a Republican state senator, when he “came upon a strange medallion that allowed him to see what other people around him really thought and it wasn’t pretty” (26). Magic is a both a connecting and a revealing force and it is a metaphor for connecting, for knowing. Some initially might find this large group of characters a little confusing, but Coatsworth provides an annotated list, which explains who they are and how these people are connected. Also, this is the nature of the novel—as these people find and come to know each other, in the cooking classes, in conversations in bed, over coffee, at dinner, so does the reader, as we all come to know the people in our lives. Cooking itself is a controlling metaphor, as a creative act, of various ingredients coming together to make a new whole, a new thing. Here, for these people who are strangers in that first class, they become a family. For me, River City was a page turner and I was captivated by these people, their ups and downs, their connections and disconnections, their reconnections, and how they love each other. I was crying at the end, but not all tears come from sadness. I also want to note that while this is a queer-themed novel, I would argue it is accessible to those outside the queer community: love and family are human themes. The recipes at the end are a bonus! I can just smell that chicken cacciatore cooking. Everyone in the River City has a secret, and sooner or later secrets always come out. The River City Chronicles is a new contemporary story enhanced by magical elements. So fair warning that if you are looking for a traditional romance, with just one couple being the main focus, this book is definitely not that kind of story. River City Chronicles features a large multi-generational ensemble cast which totally enriches the story. While I might consider Matteo and Diego the 'main' couple of the story, the author spends equal time with the rest of the cast. Again the cast is diverse with both LGBTQ characters and non-LGBTQ characters from a late teen girl, Marissa, struggling after her parents kicked her out, to the recently widowed yet still feisty red-headed Carmelina, and of course our main couple Matteo and Diego who've recently moved here from Italy to open a new restuarant. This is truly an ensemble cast story as the book features each character, in equal measure. There's also a magical element floating throughout the story touching each of their lives, also weaving the thread of magic around the entire group. I thoroughly enjoyed The River City Chronicles. I liked the entire ensemble cast and how their stories connected in multiple places. The storytelling throughout this book is a particular strength of this author as he constantly provides a full, rich storyline no matter where the character lies within the story. While the story starts off a tad bit slow, that's to be expected when setting up an ensemble cast as diverse as this one and with as complicated of backstories as they all have to share. I will admit that I'm a huge fan of this author's science-fiction and paranormal stories because of his care in the storytelling. He did not disappoint in The River City Chronicles and tells a fantastic, engaging story that keeps you reading until the end of the book. I highly recommend this, especially now that it's summer. This is a great sit by the pool and get sucked into the story type of book. So go and grab yourself a copy and see for yourself. A cast of delightful characters serve as the centerpiece of this wonderful book from J. Scott Coatsworth. Newly emigrated from Italy, Matteo Bianco and Diego Bellei have opened a modern Italian restaurant, Regazzi—The Boys—but things aren’t going as well as they hoped. In an effort to garner interest in the too empty restaurant they being a Sunday cooking class. Ben Hammond is a trans man adjusting to life and taking time off from his former job to finish a novel about what it’s like to transition from woman to man. He longs for more out of life. Brad Weston runs a community center for LGBT youth where he meets Marissa Sutton, daughter of well off parents who don’t agree with her bisexuality. Brad’s partner, Sam Fuller, is a writer who’s just published his first novel and is working on the second one. Carmelina di Rosa has recently lost her husband. Tired of the life she’s been living, she decides to head to a cooking class at a local restaurant because it sounds like it might be fun. Then there’s Dave Ramos, Carmelina’s gay tenant, a human resources consultant who works from home and spends most of his time behind there. This story unfolds slowly, like the layers of a well crafted lasagna, rich and flavorful as the cast of characters come together, their lives slowly intertwining. The tale grows, getting better and better as you read, each event--some minor, some major--pulling the characters together to create a finely crafted novel. The writing is solid, the narrative flows smoothly from scene to scene as the story develops. These become solid, real people, not just a series of names on your screen as happens with so many novels these days. They have their foibles, their dreams, joys and defeats that breathe vivid life into each and every character, even those secondary to the main ensemble cast. Add love of food, a touch of magic, and the hand of Fate, and what you have is a feast for readers who enjoy a character driven, highly entertaining read. In short, I thoroughly enjoyed this book and found it to a pleasure to read. I highly recommend it to anyone seeking a good, solid read without any overly dramatic scenes or other stock tropes which made this book a refreshing change. I have yet to read a J. Scott Coatsworth story I didn’t enjoy, and this is no exception. The River City Chronicles was originally written as a serial story on the author’s blog, but this is my first time reading it, and I think it works wonderfully well in this format too. The story starts with introductory chapters from each main character’s perspective, which gives a taste of each of their ‘set ups.’ Then, as the story gets going, all of their stories interconnect and mesh as they meet, and be I have yet to read a J. Scott Coatsworth story I didn’t enjoy, and this is no exception. The River City Chronicles was originally written as a serial story on the author’s blog, but this is my first time reading it, and I think it works wonderfully well in this format too. The story starts with introductory chapters from each main character’s perspective, which gives a taste of each of their ‘set ups.’ Then, as the story gets going, all of their stories interconnect and mesh as they meet, and become friends, and in some cases, more. I like the way characters are introduced as they meet with others I’d already ‘met.’ Although this story does have some romance in it, I thought it was more of a story about friendship, family, and the latter being those we choose and make ourselves. The characters feel very real. I was drawn into the story immediately, and wanted to know more about the overarching story, the characters, and how they would interact. The chapters are a great size, perfect for diving in and out of the story although, as I approached the latter part of the book, I didn’t want to put it down as I wanted to know how everyone’s stories would end. The story is a lovely, easy, feel-good read with plenty of ‘heart,’ and I very much enjoyed it. Although I could guess how some characters were connected to others, and how their stories might unfold in places, it added to my reading enjoyment, rather than detracted from it. 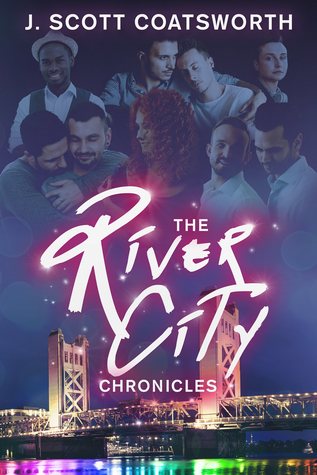 I’d recommend The River City Chronicles to readers who enjoy a feel good story with real characters with a focus on the important of friends and family, both the ones we are born into, and those we choose. Warning: This book is not for you if you do not like following a large cast of MCs or get annoyed/confused by characters whose names start with the same letters or seem too similar. I’ve seen many good books dinged in the ratings for this particular personal preference and I’d hate to see it happen with this book. With that being said, if you are in the mood for a feel-good story following the lives of a group of strangers connected through a bit of serendipitous paranormal guidance, then you will really enjoy “River City”. Each character is at a point of transition in their lives, and in various ways have a need of the others. Italian immigrants Matteo and Diego begin giving cooking lessons at their floundering restaurant, Ragazzi, in hopes of drumming up much needed business, while each man struggles for different reasons with their fear of being deported. Their first class brings in Carmelina, who is trying to learn to live life without her husband, Marco who is becoming dissatisfied with his life of hook-ups and his reasons for them, and Marissa a homeless 17 year old trying to survive on the streets and the pain of betrayal from being kicked out by her parents. Eventually, the group expands to include Carmelina’s neighbor Dave, who has become a bit of a recluse since his partner’s death 5 years ago, Brad, who runs the LGBT youth center Marissa frequents and for whom Matteo does web design, Brad’s partner Sam, and then Ben who works at a favorite coffee shop of Matteo’s. The book follows them along their individual, yet interconnected journeys as they reconcile with their pasts and sorrows and find new love, friendship and family together. While there is a lot of joy and good feels, each person has their share of hardships and pain to deal with in the course of the story, and although I did not connect with or feel all the characters’ storylines were as well-executed as others, the story was well-written, engaging and worth the read. This superbly crafted story is so full of love and promise (and lots of characters of every orientation). It's also loaded with sweet💜 romance and some 💔heartbreak moments followed by healing (and maybe a hint of ghostly magic!). And, as a bonus, there are even some mouth-watering recipes at the end! From cash-strapped restaurateurs Matteo and Diego comes the impetus for a solid community of friends to form. Matteo's plan for increasing their income by offering Italian cooking classes slowly draws more and more students and all of them lead interesting and gradually interconnecting lives. I could not believe how well this story flowed and how quickly I was drawn in to all of their lives and loves. OMG, I could not put this book down. I started after finishing another book yesterday at dinner time and finished this one at 5 A.M. with breaks for a shower and cooking dinner. The characters were diverse, complex, fun, quirky and romantic. The characters personal stories all intertwined and were mixed with a little magic to make this book unforgettable. An ARC was provided in exchange for an honest review. this was amazing.. i loved everything about this.. it had paranormal aspects.. it had mystery and intrigue. it kept me curious what was next and wondering what was going to happen.. and it made me smile and laugh.. also some spots made me so sad.. the writing was superb.. i felt as if i was a part of them and their story not just reading it. it was wonderful ! This is a wonderfully told story. The story has a little bit of everything. Some magic, charm, sadness and people coming together to make a family. Just a charming read. I received a copy for an honest review. A wonderfully written story of a group of strangers whose lives become intertwined. Sadness, joy, humor, sweetness... the story touches you and won't let go. Fantastic characters, an intriguing and entertaining story, and a touch of magic... I highly recommend this book. This book is one extremely great book to read! All of the characters were well developed and the story was so wonderfully written that I was totally glued to my kindle until the very last page! Scott lives with his husband in a leafy Sacramento, California suburb, in a cute yellow house with a pair of pink flamingoes in the front yard. He has always been in the place between the here and now and the what could be. He started reading science fiction and fantasy at the tender age of nine, encouraged by his mother. But as he read the golden age classics and more modern works too, he started Scott lives with his husband in a leafy Sacramento, California suburb, in a cute yellow house with a pair of pink flamingoes in the front yard. He has always been in the place between the here and now and the what could be. He started reading science fiction and fantasy at the tender age of nine, encouraged by his mother. But as he read the golden age classics and more modern works too, he started to wonder where all the queer people were. When Scott came out at 23, he decided he wanted to create the kinds of stories he couldn't find at the bookstore. If there weren't gay characters in his favorite genres, he would reimagine them, filling them with queer men. He'd remake them to his own ends, and if he was lucky enough, someone would even want to read them. Scott's brain works a little differently from most folks - he sees connections where others don't. Born an introvert, he learned how to reach outside himself and connect with other queer folks. Scott's fiction defies expectations, transforming traditional science fiction, fantasy, and contemporary worlds into something fresh and surprising. He also created both Queer Sci Fi and QueeRomance Ink with his husband Mark. His writing, both romance and genre fiction, brings a queer energy to his work, infusing them with love, beauty and strength and making them fly. He imagines how the world could be, and maybe changes the world that is, just a little.